Growing up I had a tumultuous relationship with my father. There were plenty of factors involved – but the basics are that he was a hard working man from a family that didn’t fit my Disney expectations. I was a headstrong young woman who disagreed with him on every point, and longed for a different, better dad. Most days we got along fine, but there was an undercurrent of tension that meant any minor event or statement might spark a war. Eventually, my teenaged self started to feel that living with him was oppressive and I couldn’t wait until I could escape him for good. He died when I was 21. My brother was 11 and my sister was 8. The anniversary of his death was this week, April 3. The fullness of time has given me a lot of peace, and while I still ache with sadness and loneliness some days, for the most part I’ve come to terms with my loss. Thankfully, we had time to talk and reconcile any petty grudges before he passed, and I was there with him the moment he breathed his last. I love you was not left unsaid. There are a few things, however, that stand out today as I think on his life, and my life without him. Things I wish I could have said to him when I was a teenager. Things I didn’t even understand at the time, that shaped our relationship in profound ways. 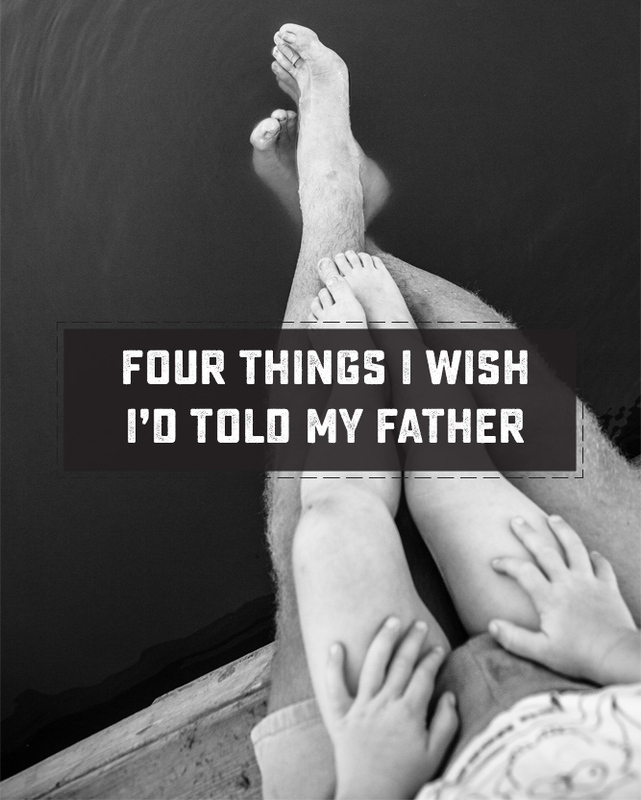 Here are four things I wish I could have told my father. I didn’t, at the time. He was flawed, with vices, bad habits and everything else that comes with being a person. I have those things too, everyone does. At that age, I held him to a standard that, in my mind, all fathers had to meet regardless of their humanity. Now, as I look at my husband learning how to parent our young son I understand more than I ever could then. He was a boy once, a teen and a young man long before he was a father. His experiences shaped his outlook as mine have for me. There is no manual to being a father and my dad was so much more than my teenage angst driven list of his faults. He had a life outside of being my dad. He was human. For years I had one singular goal when it came to my dad. To show him. You know, in that “I’ll show him!” vengeful kind of way. I wanted so badly for him to think that I didn’t need his advice, his understanding, or his rules. I didn’t need him questioning where I was going, or with whom. I didn’t need to explain my choices to him. I didn’t need to tell him what was going on at school. Somehow, I thought that if I was totally independent of him, we’d argue less. I thought he’d just give up trying to control me and I could go on about my life. Now I know how utterly ridiculous all of that was. The logic that my dad asked those questions or made those rules in some maniacal attempt to control me, rather than because he cared about me, was broken. Also, there was no way I was ever going to not need him. I still need him. I discover new ways of needing him every step of my new parenting journey and I cannot express how glad I would be to have to explain myself to my dad again. Something about men and women, dad’s and daughters seems to be innately volatile. At our emotional core my dad and I were different in a way I’d never experienced in my young life. My feelings were raw and untamable but they stood in the center of my view of myself as pillars of who I was. My dad, on the other hand, was methodical and logical, and utterly incapable of understanding those teenage girl emotions. So, he tried to apply logic, and his rules and opinions to me. He made the mistake that countless men, dads, husbands, brothers, and friends, make with their more emotional counterparts – he tried to tell me how to feel. More than that, he shared reasoning on why I should feel that way. Not surprisingly it ended poorly. Every time. Sometimes explosively so, and with lasting consequences. Looking back I know I wanted one thing from my dad, the first man I loved in my life. I wanted him to understand me. His explaining away the parts of me that I thought were important hurt me. I felt he was dismissing me and who I felt I was. I felt as if I wasn’t important to him if I couldn’t fit into his viewpoint. I couldn’t articulate it then, and I’m sure he didn’t know. Every tear filled shouting match left me a little bit more devastated. I wonder if I could have communicated that to him, how we might have changed our conversations. Trite platitudes of appreciating the people you love are plenty, and said in much better words than I can find. I will say that when Dad died I felt his loss for myself, and for my young brother and sister. We lost our Dad, and we’ll miss him for the rest of our lives. I hadn’t expected, however, to feel his loss for my Husband and my Son. For those like my son, who will never have the opportunity to meet my Dad, I’ve come to understand my sadness isn’t over the loss of my son’s Grandfather, because he can’t miss what he never had. It is for the loss of the mechanic with the mustache, the one who told stories of dunebuggy adventures and gave advice. The one who cried building a coffin for a cat. The guy who thought a sweater was a dressed up as a person could get. The one who courted my mom, and who made things with his hands to show love. In short – the loss is for that man in particular. All of his personality, all of his life experiences, not just a man on the family tree under “Grandpa”. That man was a treasure, and I feel sad that my son will never have that treasure in his life. It is sometimes unfortunate that a lot of self-knowledge and emotional maturity can be gained only from age and experience. It is only now that I am twice the age I was then that I understand these four things. As time passes and I continue to grow I’m sure I will understand even more. I can’t fault my young self for being young, for having feelings, or for pushing back against my father’s way of viewing the world, but I wish I could go back in time and tell that girl about these four things. Then again, knowing her like I do, I know she wouldn’t have listened.